Familiar faces, unchanged cabins, and the same dark lake haunt Nightingale, even though the camp is opening its doors for the first time since the disappearances. Emma is even assigned to the same cabin she slept in as a teenager, but soon discovers a security camera--the only one on the property--pointed directly at its door. Then cryptic clues that Vivian left behind about the camp's twisted origins begin surfacing. As she digs deeper, Emma finds herself sorting through lies from the past while facing mysterious threats in the present. And the closer she gets to the truth about Camp Nightingale and what really happened to those girls, the more she realizes that closure could come at a deadly price. 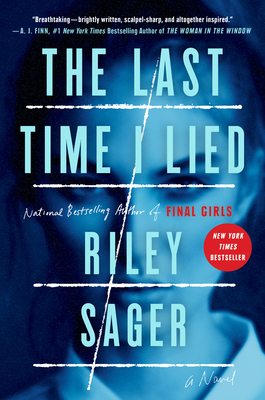 The Last Time I Lied is the second thriller from Riley Sager, the pseudonym of an author who lives in Princeton, New Jersey. Riley's first novel, Final Girls, was a national and international bestseller that has been published in more than two-dozen countries.